come on, people, joe beef deserves its own thread. here's my write-up of dinner there last week. "Neither is or would be a cheap meal but for what we ate it is remarkable (half what we paid per head at Shunji in December). You can spend as much in Minneapolis (or any other American city) for a meal at a name restaurant that will be a fifth to half as good using ingredients that will seem substandard by comparison: these were some of the best oysters I have ever eaten, probably the best lobster I have ever eaten (and the entire goddamned lobster was on the plate), steak up there with the best I’ve eaten, other-worldly lamb, and there was a veritable bucket of foie gras in the parfait. And we didn’t clear $80/head. I don’t know anything about the economics of the restaurant scene in Montreal but if we lived there we could actually afford to eat there once a month. It’s no wonder reservations are so hard to get." Joe Beef is wonderful. I think I've written about it at least twice. are your write-ups floating somewhere in that massive montreal thread?
" which made me wonder what people do when it’s really cold outside"
Wait outside. Or at Vin Papillion. a clever idea: opening another business to serve as a holding area for your first. i'm still trying to figure out the economics of that lobster dish. i estimate that the retail cost of that lobster alone would be $30 us. say another $10 for the rest of the ingredients. this means that if i were to try and make an infinitely shittier version of that dish at home it would be only about $5 cheaper than the restaurant's version. which seems wrong considering how good that dish was. too bad you missed the horse. perhaps the fullest i've felt in my life was after dinner at joe beef. (we had the foie gras double down.) i also felt terrible the next day driving back to the states. Right now it's close to cost, but during the season, lobster can be quite cheap in these parts. yeah, it's still highly unlikely that it would ever be available, at those margins, in any american restaurant of that reputation/class. Told ya it's better than Per Se. This comes back to Wilfrid's comment about the lamb's neck - if they're charging that, it reflects cost. There's often a huge spread in the mains that seems more likely to be due to labour and ingredient costs than Joe Beef trying to bilk us (ie. our veal's belly last year was $26 and huge, the cerf a la royale was near $50 - that's not cheap, but it's all fair). But yes, it is a rare and tremendous restaurant. Man comes to visit a household. Wife is in. Husband is out. "He's out shooting peasants," the wife replies. "You must mean pheasants," the man answers. "You don't know your hunting." "I mean peasants," the wife says. "You don't know my husband." At Per Se, instead of complaining about overpriced $50 serf, you can complain about $50 supplements for an ounce of scerf. I've been twice over the years...great generous guys,fun place to be,and yes,the best oysters I've ever et. 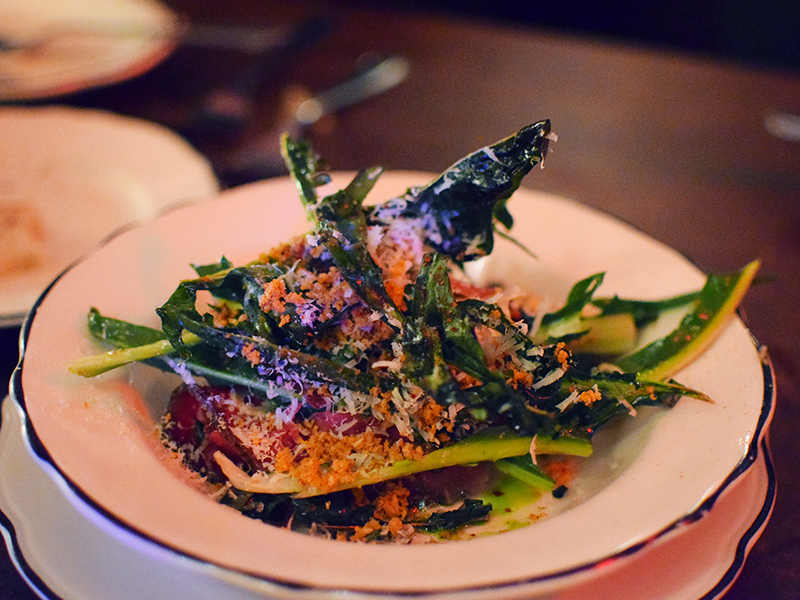 finally got around to writing up our dinner at joe beef in late october. great food but if you want to take good photographs of it you have to go when it's possible to sit outside in natural light, i guess. here's the beef "gravlax" with fried puntarelle that was one of the highlights.